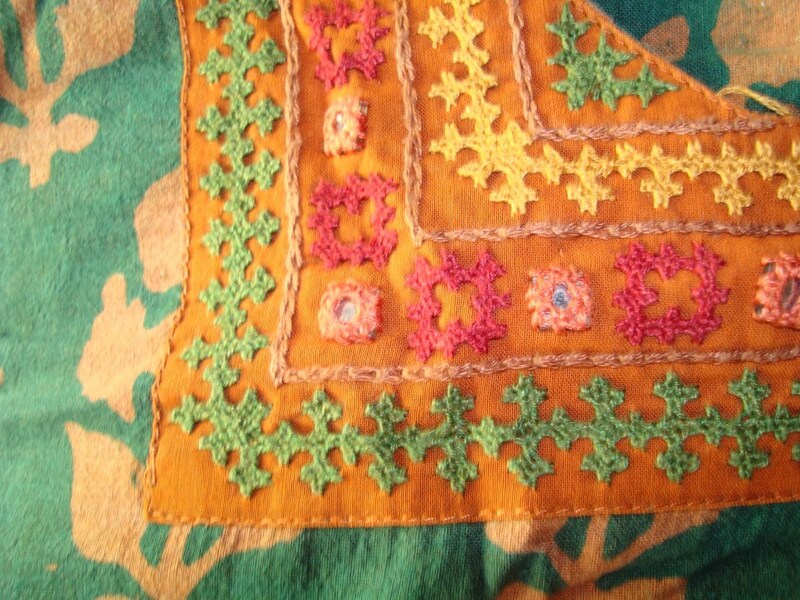 The working of the stitch is on Queenie’s blog. After coming across this stitch many times over the years, there was never a thought, that this could be a stitch by itself. It looked like a filling or unfinished filling stitch. After seeing this on SSS challenge, I thought the braid stitch can be learnt later and started with this stitch sampler. 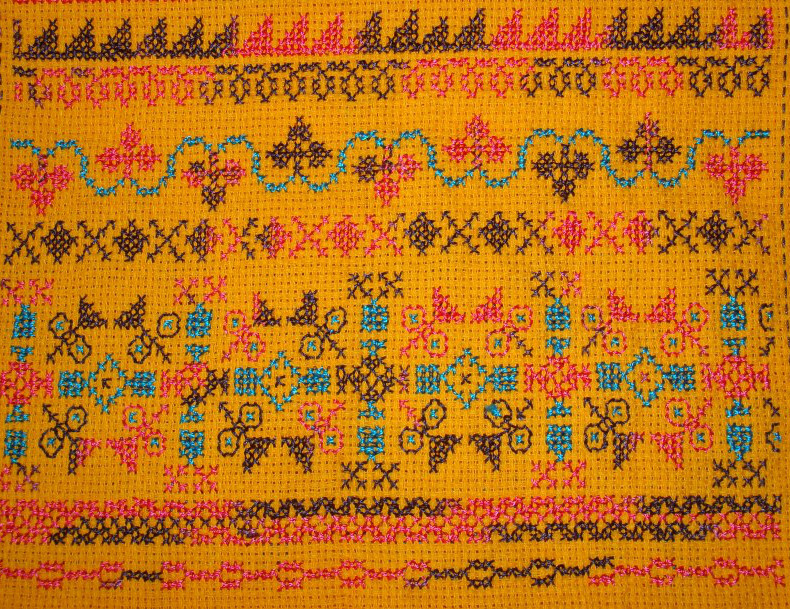 The sampler starts with individual Chinese cross stitches. Two crosses are worked together in the second sample. The crosses are worked continuously in a row in the third sample. It started with two rows of Chinese cross stitches in the fourth sample, but realized it has to be varied to get a flowing pattern. The variation was made in the first sample in this part of the sampler. This will make nice filling pattern. Two rows of Chinese cross stitches are worked with space between them. This way other stitches can be incorporated along with this stitch to make a nice border. Upright Chinese crosses are worked in the third sample. The Chinese crosses and upright Chinese crosses are worked together to form a border in the fourth sample. Three Chinese crosses are used as border in the last sample. Individual Chinese crosses and upright crosses are worked in the first sample. Two rows of upright crosses are worked in the second sample. Working the Chinese crosses in two colours are tried in the last two samples. 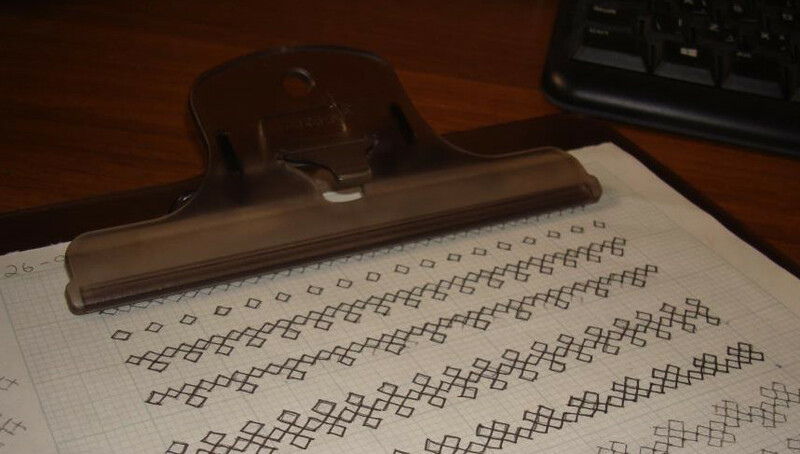 This Chinese cross can be used for filling and border patterns. Easy to work stitch. This stitch can be used to add texture to otherwise plain fabric too, like Sashiko embroidery. Just pondering over some ideas. We are back in Muscat slowly flowing into routine. I am better now. The SSS challenge and TAST challenge both have new stitches to work. The upright cross stitch is an easy one. I hoping to start on it tomorrow. After that I have to work on beaded oyster stitch on TAST challenge. Before returning to Muscat, I managed to work on my friend’s saree. 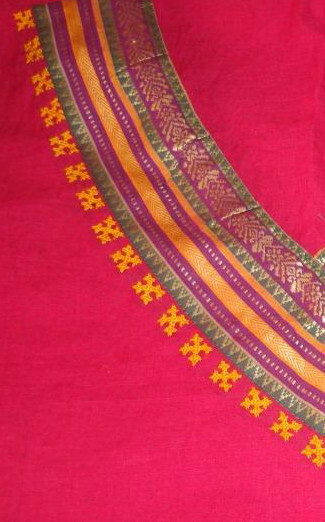 A kutch work line along the width of the saree, which could be more than 40 inches. 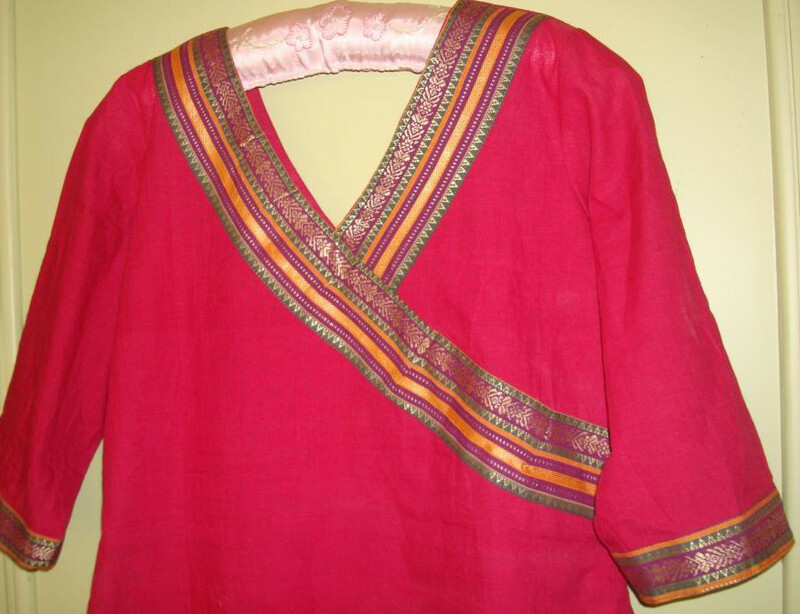 The kutchwork line in two colours was worked on the sleeves of the blouse also. Nothing else was done other than this project and packing in Chennai, India. 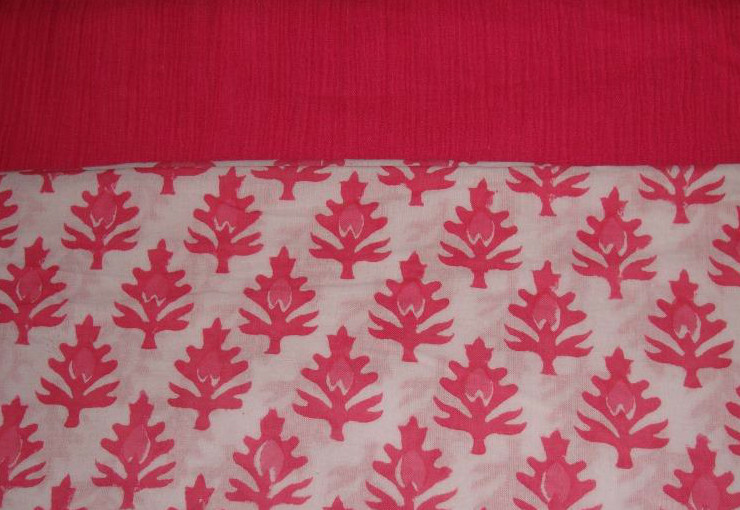 I have unpacked the fabrics bought in Chennai. Phew!! Some or most of them would require embroidery, which would be looked into during the next week. Lots of work to do. Today we’ll see how to draw neck on paper using a sewn tunic. 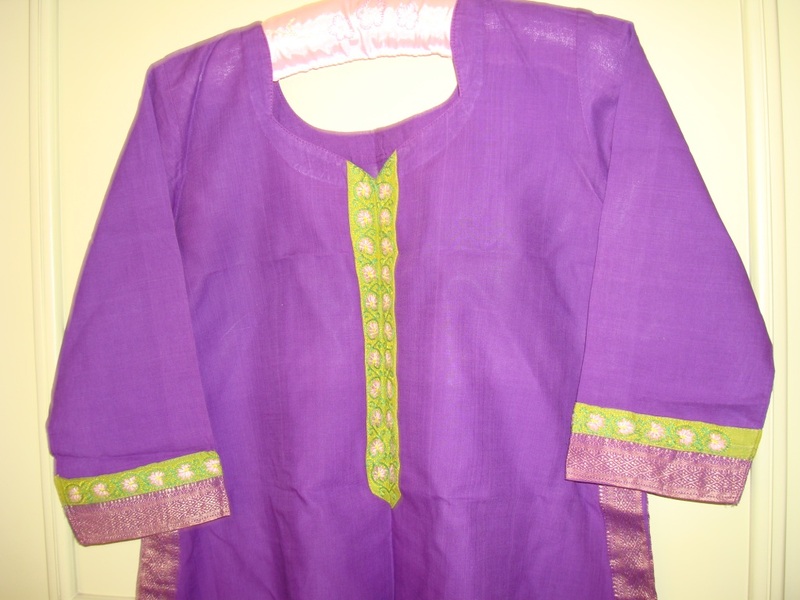 Ensure that the tunic is perfectly sewn and has a simple neck design. Place the tunic flat on any surface. Imagine a line on the middle of the tunic. Place a scale[ best is using an inch tape, I couldn’t hold the tape and take a picture, so used scale] on it. Here, we are measuring the depth of the neck in front. Stretch the fabric, measure it and note it down. It is 6.5 inches. Now we’ll measure the wideness of the neck. Placing a paper [keep a scale] on the middle line, using it as the starting point, using an inch tape measure the width of the neck. It is 3.1/4 on this sample. Fold a large paper [ A3 or B3 size] in the middle. Meaning the narrow side should be folded in half. Mark a point on the fold at the top of the paper leaving a 5mm space. This is the starting point. The depth is noted on the fold [y axis] from the starting point. And the width is noted from the starting point perpendicular to the fold. Now draw a neck design of your choice. Remember that, this is half of neck, whatever you draw will be half pattern, after drawing or tracing or copying the pattern on this half, place a carbon, red, blue or black, this ink side should face the other half of the paper. When we draw along the pattern placing the carbon like this, the original half pattern gets copied on the other half. This technique is simple, fool proof. 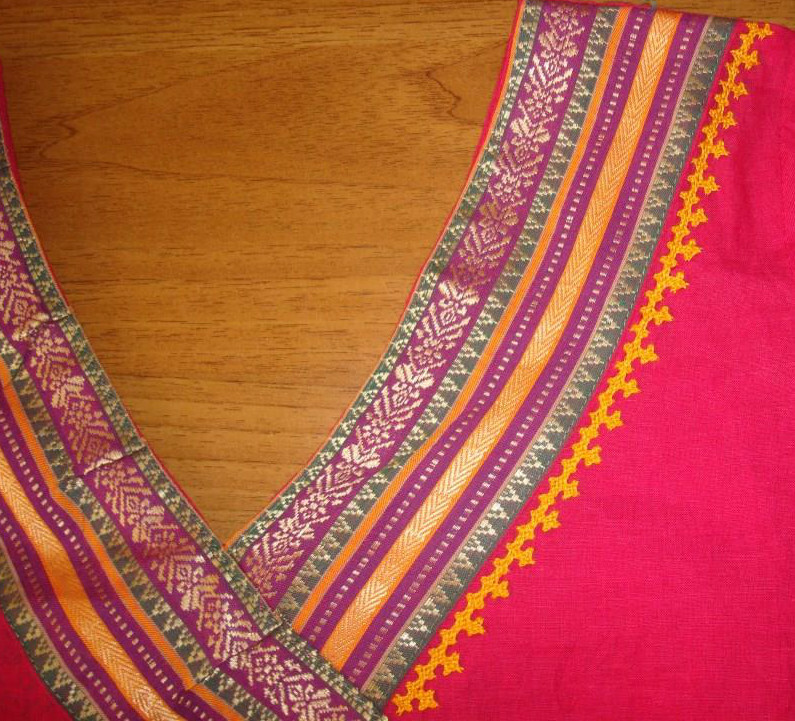 After drawing the neck line, individual motif patterns were drawn around it. 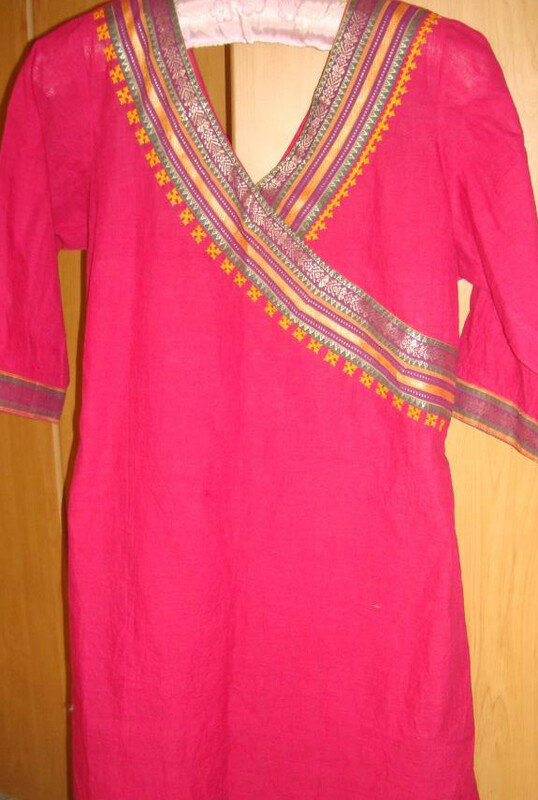 The tunic material is chiffon. It does not have a lining. The neck required a fabric which will hold the shape. The neck is deeper in this sample, it requires a vest to wear underneath it. 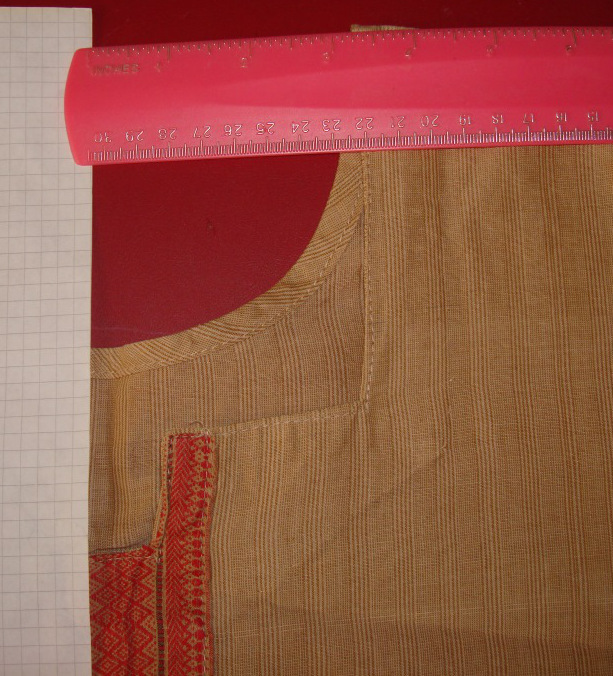 This sample is to show that sometimes pattern can be drawn and embroidered after the tunic is sewn. We just need to have some basic idea to the work on. 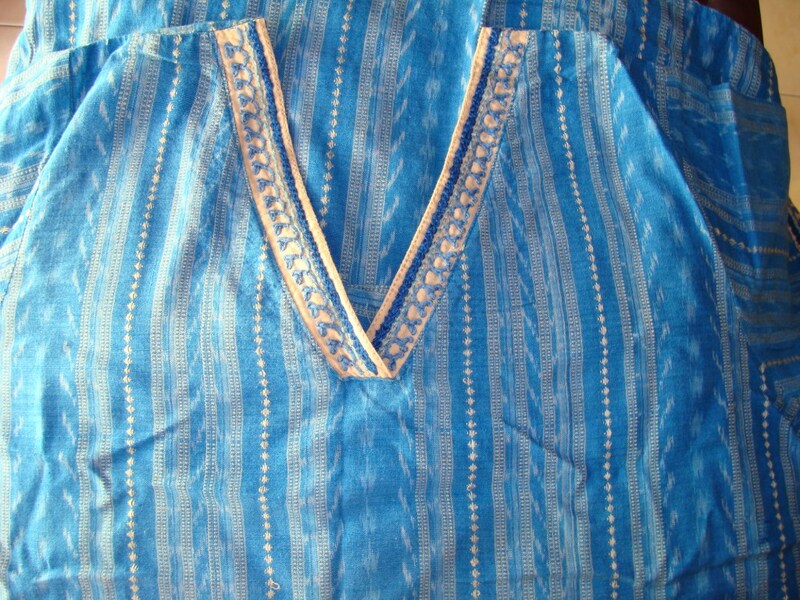 The tunic fabric is cotton ikat. 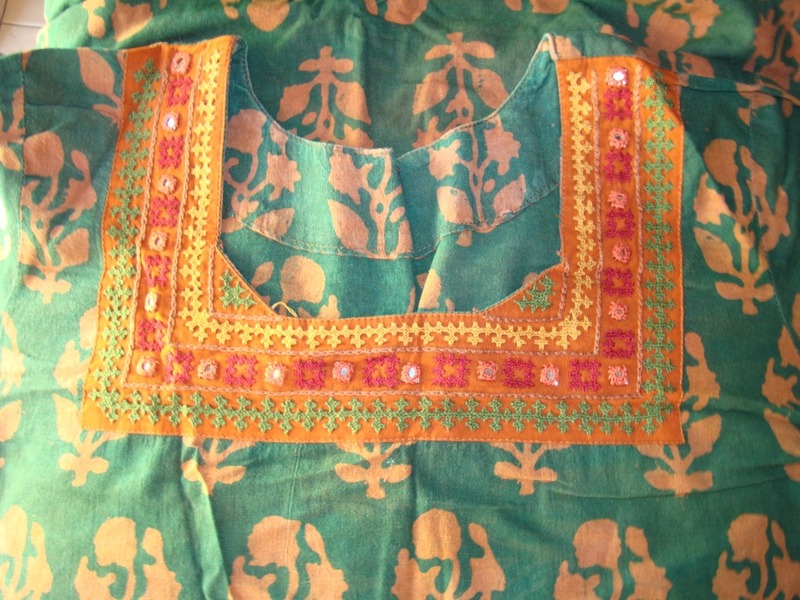 The embroidery is Kashmiri couching. 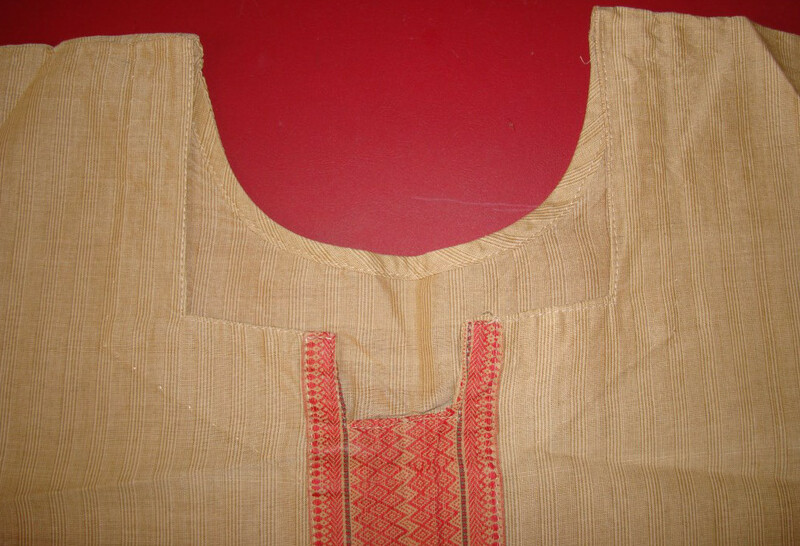 The tunic was sewn with this cross over neckline in beige fabric. Marking with scale the pattern was drawn. The pattern was two lines and points at equidistant. And embroidery commenced at that point. 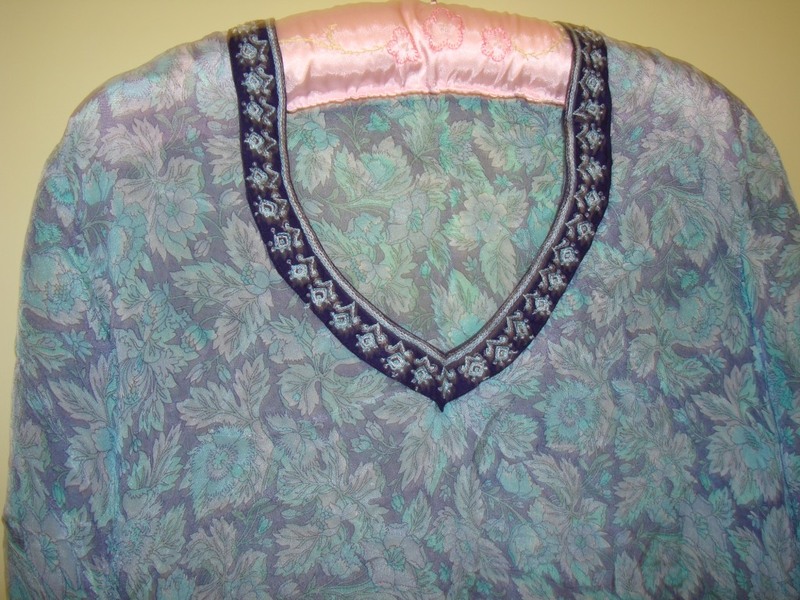 The fabric with the copied pattern was sewn on the tunic first, and the embroidery was worked on that later. 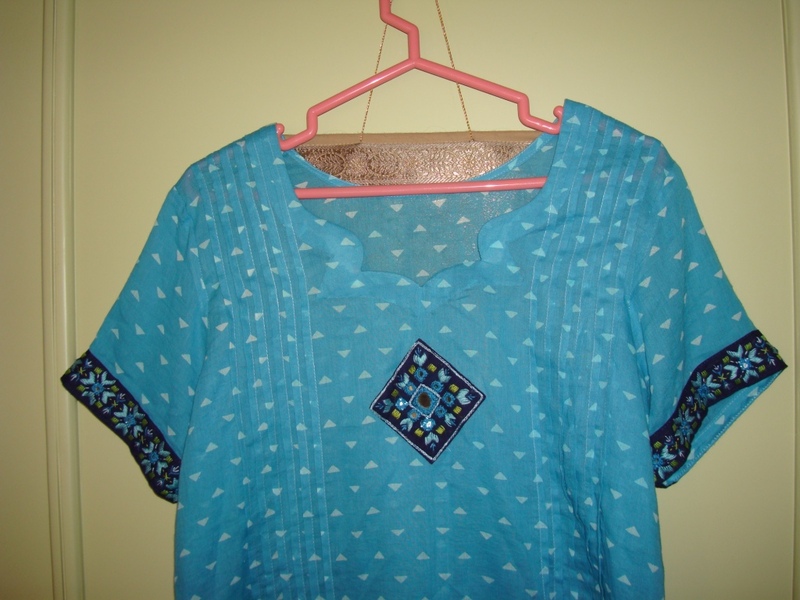 In this sample, the square neck I had drawn and designed seemed too broad, so added a small triangular motif on both sides, to narrow the neck . These samples here are to show that, it is better to have some idea of necklines before drawing the pattern and embroidery. Things to note- if the embroidery is done very well but sewing it on the tunic is not done properly, the whole project will be constant reminder of the shortfalls made by either party. And, it is difficult for the person sewing to rectify any mistakes of the embroiderer. These are samples to further explore embroidery borders worked on separate cloth, and are later attached to the tunics. 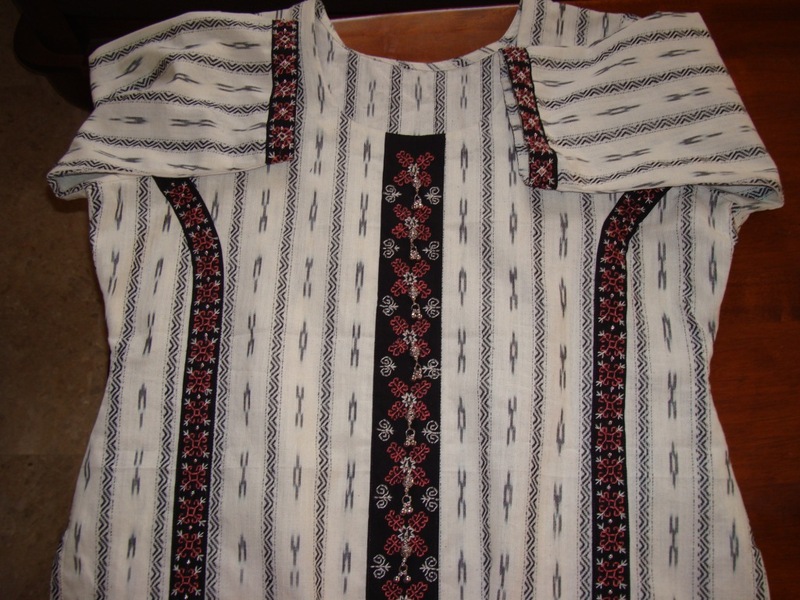 In this ikat mercerized cotton tunic, Black work embroidery border is worked on aida cloth. This easy in the sense, the pattern tracing is totally avoided. Cross stitch, black work, kasuti , chicken scratch embroideries can be worked on aida, matti or any other fabric with checks, dots. Measure the length of the border required and start the embroidery. 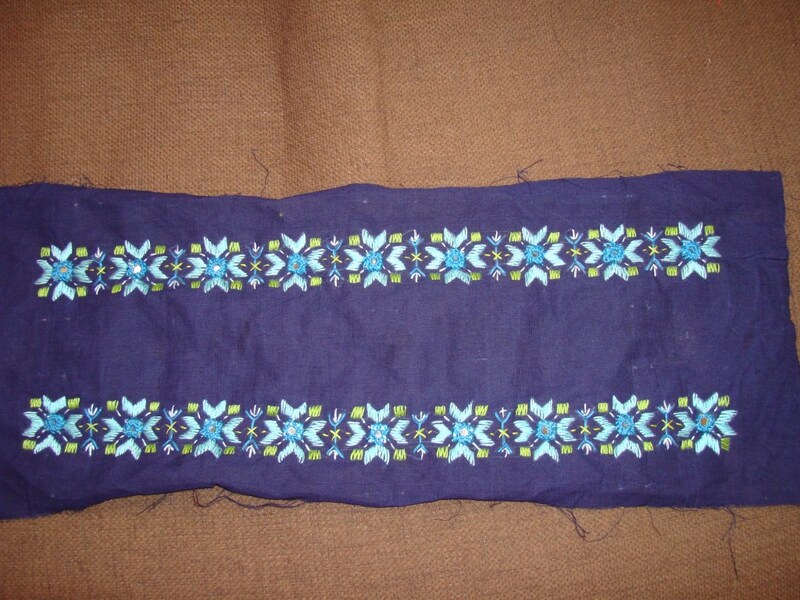 These are mirrorwork/ phulkari borders done on dark blue fabric. These are for sleeves. note the extra space on either sides for the seam allowance. 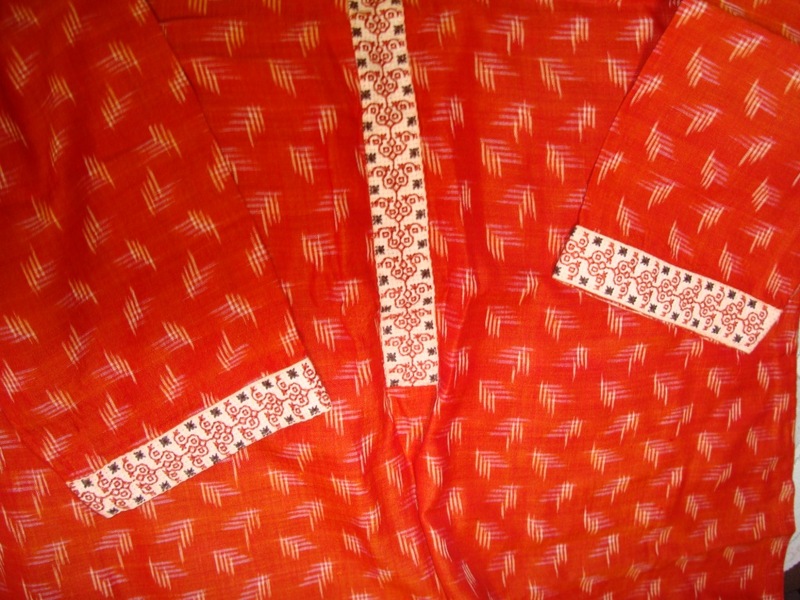 The same embroidered border along with a small motif attached to a Bengal cotton tunic. I did not attempt the neck because the tunic fabric is fine count cotton, the mirrors and embroidery might have weighed down the neck. 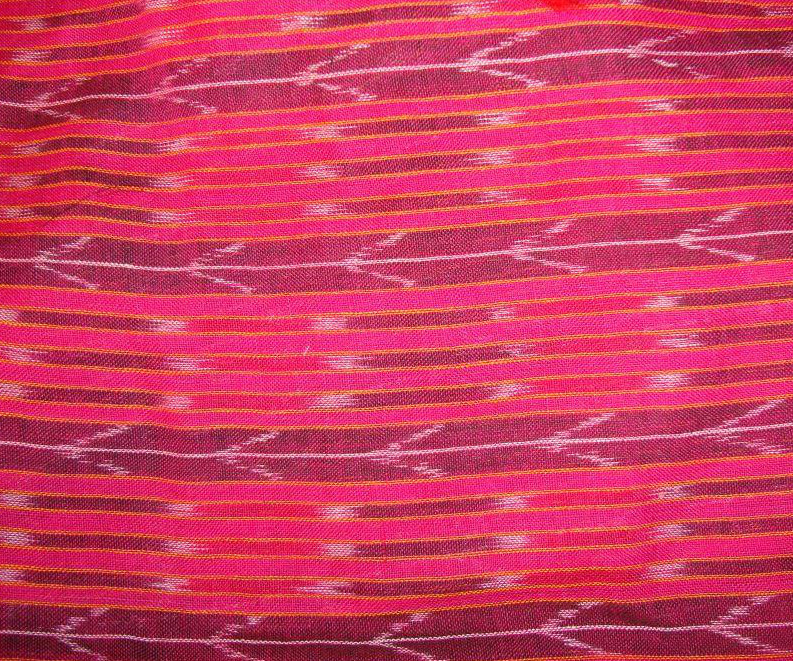 The tunic fabric is cotton ikat. The same black work border notion is elaborated here. 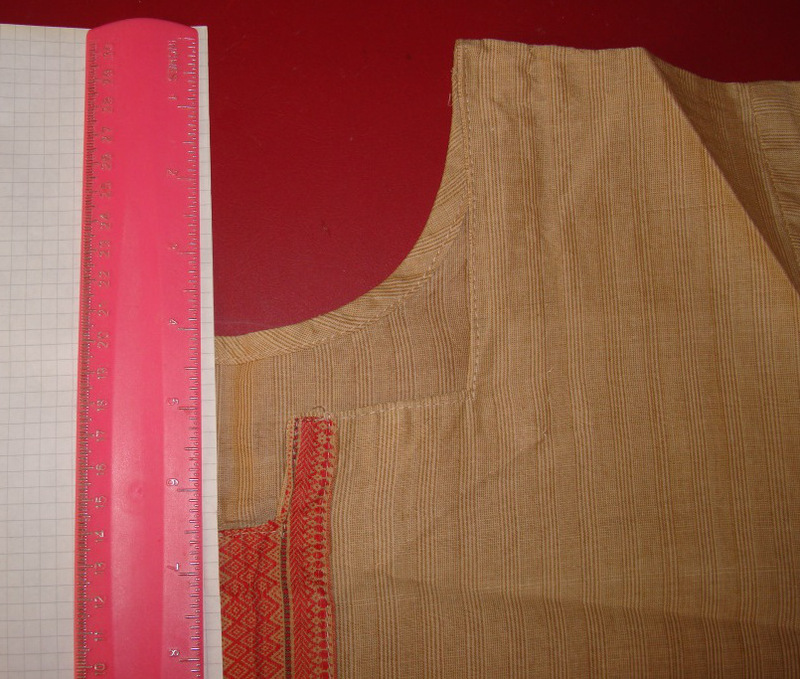 The length of the tunic below the neck, the sleeves, two panels on the sides were measured. The black work pattern was drawn on black mangalagiri cotton fabric. And the embroidery was done with threads and some silver beads. The pattern tracing was in full swing for this tunic! This tunic is a recycled tunic. 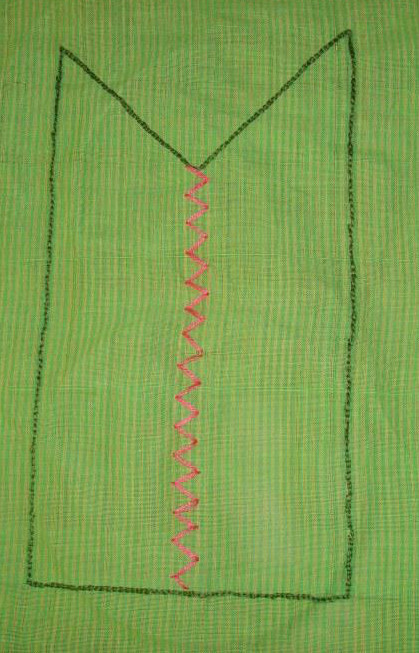 Meaning, the embroidery on the green fabric was done on another tunic, which became too tight. 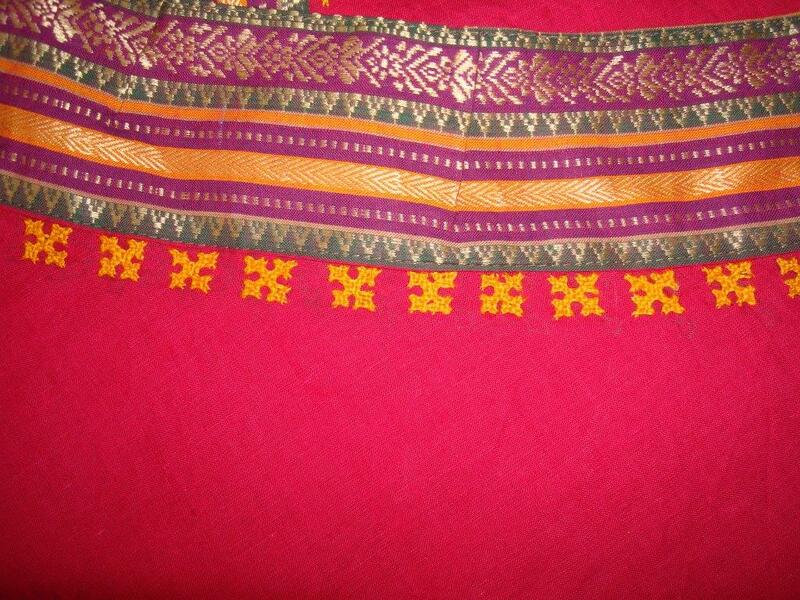 So these borders were attached to this violet mangalagiri tunic. This is the first level in embroidering on wearable. The focus is on colour coordination, pattern choices and the embroidery itself. And this is an attempt to give an idea to start .These borders are faster to work, and chances of making mistakes are minimal and they are also easily rectifiable. It is better to start with small borders. Once we are comfortable working this we can move on to drawing the neckline on paper.